Herein lies the next thrilling installment in the saga of Roo’s Smart Jacket. To recap: Toast Size 10 was too big, so I returned it at great expense by First Class post on 5 January. On Thursday, I realised I had neither received the smaller size in exchange, nor a notification that the returned item had reached the warehouse. So I emailed them. Within an hour or so they had rung me to process a refund to my account: in the intervening period, the jacket had sold out in the smaller size. SOB! Lesson learned: next time I should order multiple sizes to keep my options open, or re-order on the web straight away instead of waiting for a postal exchange to be processed. I lost £12 in postage costs. Grump. Lucky I didn’t plan an entire wardrobe round it, eh? Humph. Meantime… I bought a cardigan. It’s from Seasalt. I liked it when I first saw it at full price, so I was pleased to get 33 % off in the sale. It is pure lambswool. It is very warm and soft and snuggly. I could live in it. I probably will. Have you seen the snow out there? Exactly. 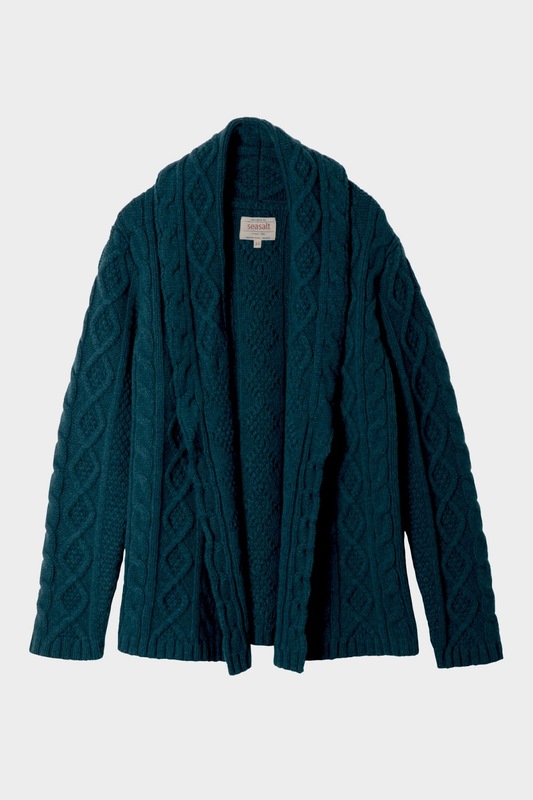 Despite my ethical vetting of Seasalt’s website, this cardigan (like the other one) is labelled “Made in China”. Obviously it must have been at the only ethical factory in the entire continent, or Seasalt would never have had the garment manufactured there, would they? Would they? Humour me. I have to believe. So… my sewing plan is upside down again. Maybe I will start with a dress and take it from there. My dear blog pal Jessica surprised me this week with an emergency care package containing 3 patterns, a piece of immensely-practical wool and a magnificent magenta Marimekko remnant from her recent make. The spontaneous kindness of blog pals takes my breath away. See that dress pattern? It must be made! I love that bow-trimmed collar! And I haven’t even used the fabric she sent me last year (and which I haven’t blogged about because clearly I am an ungrateful cow)! New resolutions: (1) do not hesitate to say a public “thank you”. (2) Do not hesitate to use incoming wonders, or you will surely bury them in the stash. My Girl Charlee order arrived – woo hoo!